Age Limit: Candidates upper age limit should not exceed the upper limit. Age limitations are different for each post. Read notification for details. Educational Qualification: Both educational qualifications & Experience required for each of the above posts, refer to the official notification for detail. Application Fee: Candidates will have to pay Rs. 1000/- (Non-Refundable) payable by way of Demand Draft drawn on any Nationalised/Scheduled Bank drawn in favour of “Central Bank of India- Recruitment of Economist” and payable at Mumbai. Selection Procedure: Candidates would be selected based on their performance in personal interview. How to Apply: All those candidates who wish to apply for Specialist Officers posts in Central Bank of India, they are required to send their applications in the prescribed format with required copies of all supporting documents, fee receipt, to the following address before 31st July 2015. 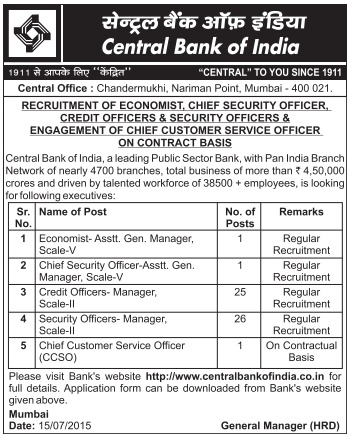 More Details: If you are looking for detailed information about Central Bank of India Recruitment for Specialist officers posts regarding age limitations, educational qualification, selection process, pay scale, how to apply and application form.